The works shown below are by: Avital Sheffer. Avital Sheffer’s earthenware vessels are etched and bevelled with the sacred, historic scripts of her Middle Eastern heritage. They articulate that delicate balance between the past and the present, revealing forms and surfaces that evoke a sense of history, while carrying narratives that transcend time. “My work is informed by an investigation of my Middle Eastern and Jewish heritage and an ongoing engagement with the landscape, architecture, languages and wisdom of that part of the world, and that way of being in the world. The world of antiquity, in its diversities and dichotomies, is a passion and an infinite source of inspiration”. 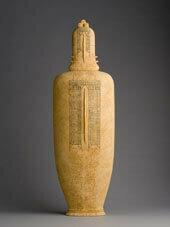 With their complex references to Judaism, Christianity and Islam, Sheffer’s ceramic pots take on an iconic status. “I am interested in the frayed edges of religions and mythologies, where dialogue and cross-fertilisation with other cultures takes place. Personal experiences of conflict, migration, dislocation and renewal intersect with the dilemmas between traditions and modernity”. 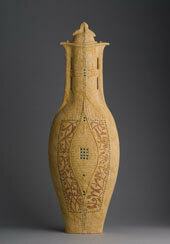 Her tenderly inscribed, lidded vessels capture and reflect the multilayered histories of Middle Eastern culture. Their dry earthy surfaces simultaneously invoke the domed cities of the Arabian Nights and the arid landscape of modern Israel. 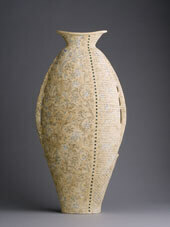 They are finely crafted, hand-built, precisely decorated, and multiple fired. Born in Israel, with a background in town planning, building and fashion and textile design, Sheffer brings a multiplicity of personal experience and technical skills to her art practice. She migrated to Australia in 1990 and now lives on the North Coast of NSW. She has a Diploma in Ceramics from Lismore TAFE College and shows her work at Beaver Galleries in Canberra and Salmon Galleries in Sydney. 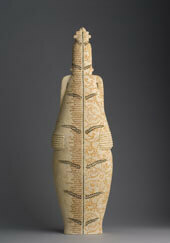 She has recently exhibited in Chicago and New York. Her work features in the collections of the Powerhouse Museum, Sydney, the Gold Coast City Art Gallery, and various corporate and private collections.